Episode 4 features my friend Lori Melnitsky, who is a Speech Language Pathologist (SLP) and a woman who stutters. Lori and I first met at a National Stuttering Association annual conference two years ago. She is a co-leader for the Long Island NSA Chapter. We have kept up with each other by phone and email. Lori has her own private practice, All Island Speech & Stuttering Therapy. She also maintains a blog, which can be accessed directly from her web page. 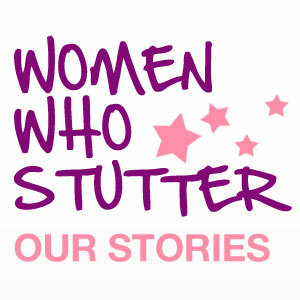 Her blog details her personal journey with stuttering and provides updates for people she works with and anyone who may be interested in therapy. In this episode, Lori talks about how she overcame severe stuttering, and how that motivated her to want to help people who stutter. We also share our opinions on fluency therapies, how tough it is sometimes to accept compliments,and how important it is for women to communicate and share with one another. Musical credit for the intro “I’m Gonna Go” goes to “Free Royalty Free Music” by Dano Songs. Please feel free to leave comments. We welcome your feedback. 7 Responses to "Positive Attitude Is Everything – Episode 4"
First, I have to say to Pam how important and wonderful that you have reached out to women who stutter. I think we can all agree that you are a natural host and communicate beautifully. It was interesting for me to listen to myself. I only started public speaking a few years ago and I found it difficult to say the least. As you can hear, I use pull outs as well and am not a pure fluency shaper (and I definitely am not close to perfect under a little stress). If we could eliminate the word “stutter” from the English language, I would be so happy.-LOL. Interestingly, the two words that can really mess me up when I don’t practice them daily (which I will admit I have not done lately) are stuttering and speech. So, I have to start that again. Anyway, I hope many women listen to this and am glad there is a forum available to help other PWS. Tks again Pam for all you do!! I really enjoyed listening to this episode, Lori you were fab! I really like this episode Bought back a few memories and really hit home. Having a person tell me that I could not do a speaking job because of stuttering. Beating myself up for stutter and thinking negative. It took me many years to learn I do not have to be perfect in what I do just because I stutter. This was great!! I just have to comment that I am really enjoying this, more than I thought I would. So far, I feel so gratified and priviliged that women have been so open and willing to do this. It feels as if I am being let in to such personal stuff, things that are really going to touch lives. I have a feeling this is going to be something very, very special. There are already two excellent, established podcasts out there. But we women – ordinary women living our lives the best way we know how – we are sharing some magical stuff. I am almost bursting at wanting to post some of the interviews I have done already. They are SOOOO good. But patience is the key. I know people have to have time to listen. But I promise, the upcoming interviews I have done are so powerful and inspiring. I am so happy to be a part of this. If only more than 43 people could read about this..
Again an excellent installment. I think Lori is a sort of celebrit in the stuttering “scene”. At least, I have seen many contributions of hers, even from my quite remote place! I was nice to hear her for the first time. Somehow, I found out that she sounds exactely like what I would have expected: very clear both in her fluency and in how she expresses things. I have always had quite some difficulties understanding stutterers who become SLP. This podcast helps me come to terms with maby of them – even if I must say I still have a few reservations. Thanks for commenting Burt. I had reservations about becoming a SLP, but am so glad I did. I meet so many speech paths who don’t get it and that is detrimental to the people who need the help most. Thanks for calling me a cellebrit in the stuttering world. That is a first for me. I was nervous doing this and was afraid I would be unclear in my message.